Jim and John Denver met in the 1970s and greatly enjoyed working together. The opportunity for both entertainers to follow up on their 1979 Christmas special with another show in 1983 was exciting and provided a chance to explore their shared interest in the wonders of nature. 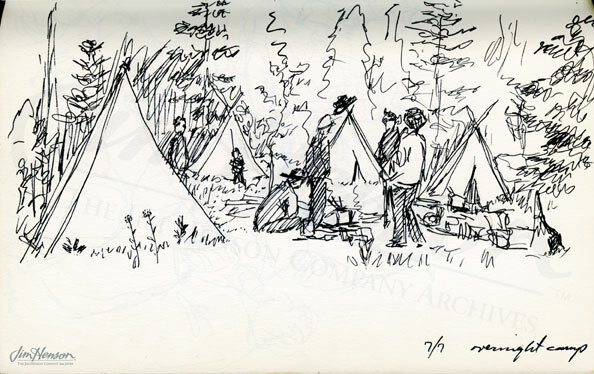 A Rocky Mountain Holiday featured the whole Muppet gang on a summer camping trip with John Denver, singing songs and reminiscing about adventures in the great outdoors. While Miss Piggy stayed home, she appeared in a couple of clips, demonstrating both her vocal talents and her preferences for the comforts of civilization. 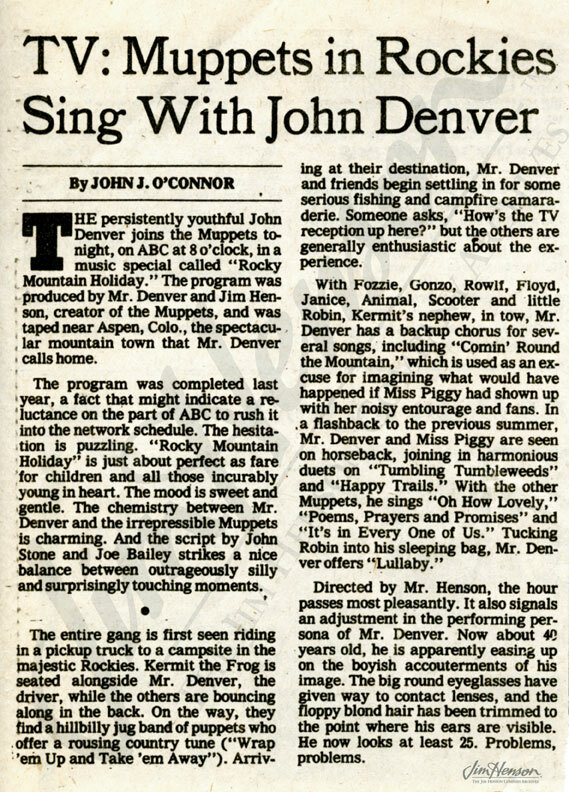 The program, written by Sesame Street veterans Jon Stone and Joe Bailey, moved easily from John Denver songs to folk standards, with the Muppets singing along inspired by the natural surroundings. Gonzo’s encounter with a giant chicken (expertly played by Steve Whitmire) and Rowlf’s incident in the lake provided some of the comic moments. 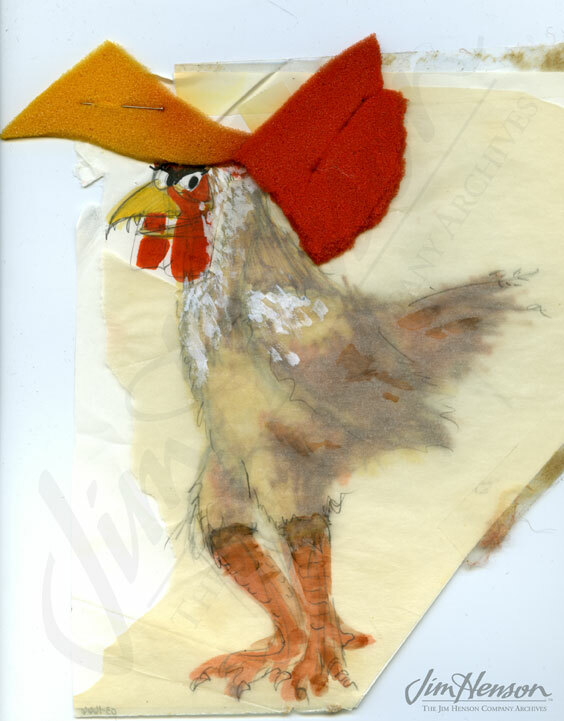 Giant chicken design sketch with foam samples, 1982. John J. O’Connor’s warm review in the New York Times, May 12, 1983. Jim’s sketch of a Henson family camping trip, Colorado, 1971. 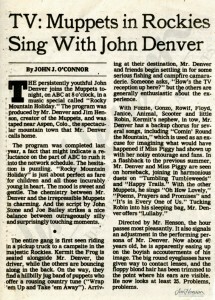 This entry was posted in 05-May '83, 1983, Muppet Show, Muppet Specials, Sesame Street and tagged ABC, Aspen, Diana Birkenfield, Gonzo, Jaws, Joe Bailey, John Denver, John J. O'Connor, Jon Stone, Miss Piggy, Rowlf, Steve Whitmire. Bookmark the permalink.